Zucchini bread is typically made with grated zucchini, but grated yellow squash can be used in its place without any additional alterations. Commonly thought of as a vegetable, yellow squash is actually a fruit because it grows on a vine and has internal seeds. Young yellow squash has a more tender skin than larger, older yellow squash. If available, it is preferable to choose younger squash so that peeling the skin is unnecessary. However, if only older, tougher yellow squash is available, you can peel the skin away with a potato peeler. This option is not ideal due to the amount of vitamin A that is lost in the peeling process. Yellow squash is significantly higher in beta carotene, a natural form of vitamin A, than zucchini. 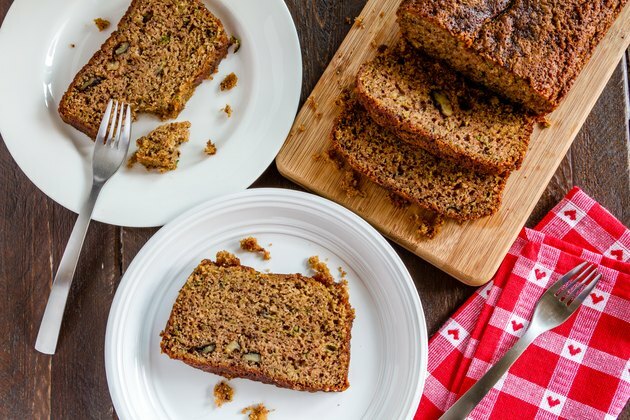 It contains similar amounts of fiber, carbohydrates, vitamin C and vitamin K. One serving of zucchini bread made with yellow squash contains about 192 calories and 46 grams of carbohydrates. Sugar and fat content may vary greatly depending on the recipe used. Yellow squash is naturally low in fat. Decreasing the fat content in a yellow squash bread recipe may be accomplished by adding an additional cup of yellow squash to the recipe in place of every 1/2 cup of oil called for. Additionally, adding 1/2 cup of apple sauce for every 1/4 cup oil called for in the recipe will accomplish the same goal. According to author Paula I. Figoni, you do not need to add any oil to the recipe if you utilize the moisturizing power of applesauce or additional squash. Yellow squash is naturally low in sugars, which makes it an ideal food for those with blood sugar issues. Bread has a high glycemic index, but using whole wheat flour in place of white flour and agave nectar in place of honey or sugar will reduce the glycemic index of this dish considerably. Check with a dietitian to determine the exact glycemic count of bread made with these ingredients to ensure proper glucose levels for your condition.